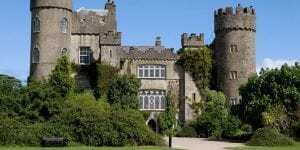 Malahide Castle, set on 250 acres of park land in the pretty seaside town of Malahide, was both a fortress and a private home for nearly 800 years and is an interesting mix of architectural styles. The history of the Talbot family is recorded in the Great Hall, where portraits of generations of the family tell their own story of Ireland’s stormy history. Many additions and alterations have been made to this romantic and beautiful structure, but the contours of the surrounding parklands have changed little in 800 years, retaining a sense of the past.